I had long thought that the Bolstridges,( normally using the variant Bolestridge), of Canada were from the same source as the large number of Bolstridges in Maine. The following information has disproved that theory although the possibility of the Bolstridges of Maine originating from Canada is still an option but this line is quite distinct from the Quebec link. A recent find from Judy Morey in Vermont is that of John Bolstridge from Ratcliffe Culey who emigrated to Canada in 1889. According to Journal he wrote that is in the possession of one of his descendants, he stowed away on a cattle ship at the age of 16 and settled in Sutton, Quebec where he died in 1952. The journal is in a psalm book from Ratcliffe no doubt one of the charity bibles that were given to poor children there. Further investigation finds John listed on the Canadian Home Children Database as having emigrated on the SS Sardinian in 1889 aged 18. John was the son of James Boulstridge and Elizabeth Blower born 7th July 1871, his father died in July 1879 along with two of his elder brothers Arthur and Alfred. There were 9 deaths in the village that month indicating a possible epidemic of some kind. His mother remarried in 1887 to William Coles, a widower, who lived a few doors away in Church Lane Ratcliffe Culey. Perhaps he didn't get on with his stepfather and that's why he ran away? John married Edna Jeanette Hopson and raised a family of twelve including five sons, most of the family today use the variation Bolestridge. Two of the sons served in the Canadian Expeditionary Force in WW1. A number of the children later appear to have settled in Vermont USA. A recent probate record regarding one of the sons, Lyndon Bolestridge, has expanded this section somewhat. 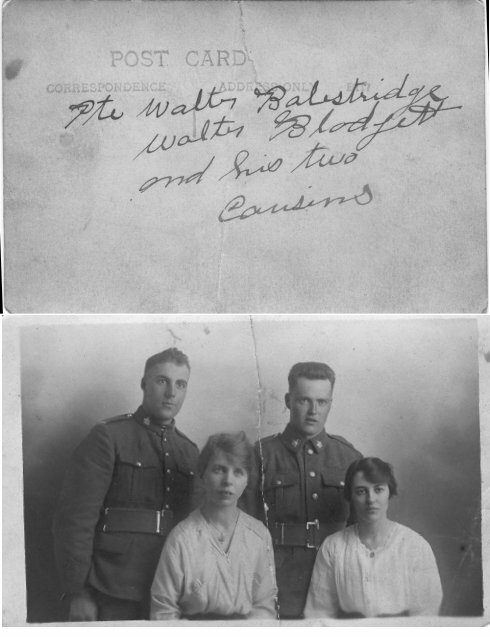 An enquiry recently regarding a Benjamin Boulstridge of Coventry, born 13 Oct 1896, who settled in Canada in 1921 has added another Canadian link. Research into these descendants is still in process although I have found Benjamin's birth at Stockingford, Nuneaton near Coventry. Please contact me if you are related.